My little one is still a little too small to feed himself, but now that he is able to sit in his highchair, I wanted to try Playtex's Toddler Mealtime Set out to see how wonderful it is. I have to say, I'm very impressed with this set. Not only does it come with everything you need, plate, bowl, a twist and click cup, fork and spoon, but they come in a couple different designs, which caught my son's eyes immediately. What I loved most about this set was that the both Plate and Bowl have a non-slip bottom that helps prevent messy baby fun and the fact that the set is 100% shatter and break proof, so just in case, when my little one gets a bit older, if he decides to throw his plate or bowl on the floor, I don't have to worry about cleaning up both food and the mess of a broken dishes. I also loved the steep rounded sides on both the plate and bowl so that once my little guy starts feeding himself, his food will be easier to scoop! 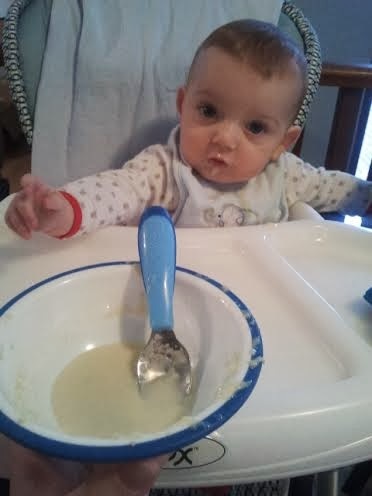 The fork and spoon is small enough to fit in his hands to where he has a good grip when he's able to feed himself, which is a good utensil starter. This set is dish washer safe and microwave safe, which is great, with how busy and active my little guy is, it's great that I can easily put his mealtime set in the dishwasher along with the rest of the dishes so that it all goes in on one load. 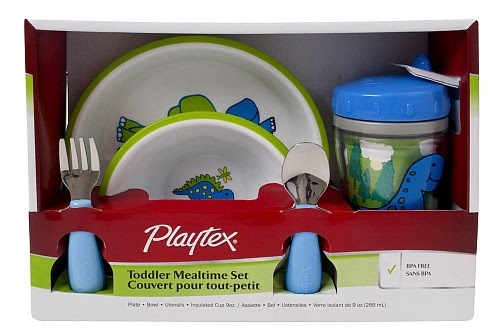 I have no complaints with the Playtex Toddler Mealtime Set and will definitely be not only recommending this cute set to friends and family, but will be purchasing a few more sets as my little guy gets bigger. It's a perfect starter set for any toddler that's also very affordable retailing at around $15.99 at different retailers including Toys R Us, you can't beat that, especially since this is a 5 piece set! Disclosure: All opinions are my own. I received the Toddler Mealtime Set at no cost for the purpose of this review.